Spring and summer are coming and that means it’s time to get the barbeque in shape for the weekend barbeque parties. Of course the fan favourite is always cooking a nice thick and juicy steak, but it doesn’t always turn out the way you planned, does it? Follow these tips and you won’t go wrong this summer. Find a piece of meat that has a lot of marbling in it. Not the big thick veins of fat, but the small ones. They will melt as the steak cooks giving lots of flavour and tenderness to the meat. I prefer striploin steaks at about 1.5 inches thick. Season the steaks with salt and cracked black pepper. Let them sit while your grill heats up. Turn the grill up as high as it will go. 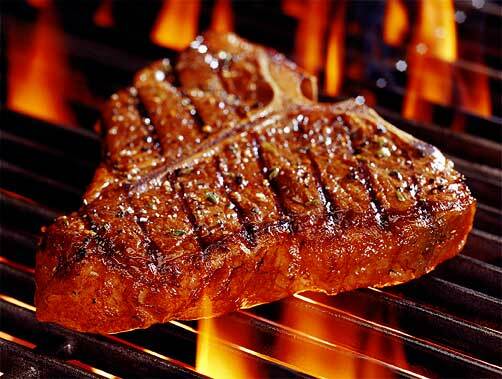 This will create a searing affect on the outside of the steak while leaving the inside tender and juicy. Once the grill is hot lay the steaks down and cook for 3 to 5 mins on each side depending on how you want the steaks done. Give the steaks a quarter turn halfway through the cooking time to give them some nice grill marks. To figure out if the steaks are done to your liking you can use a meat thermometer or use your finger. Poking the fleshy part of your hand under your thumb, while your thumb is touching one of the fingers on the same hand or none at all will feel the same as your steak at certain levels of doneness. Try these tips out and find the seasoning that suits you best. Watch out for flare ups and try to get the same cuts of meat each time you cook steaks so that your results will be consistent.